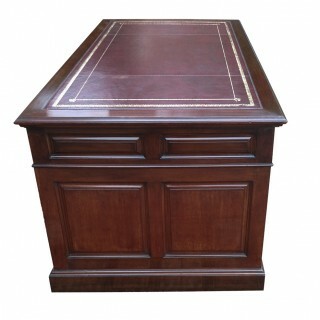 This substantial antique Mahogany pedestal desk is beautifully constructed and made from well figured mahogany timbers. 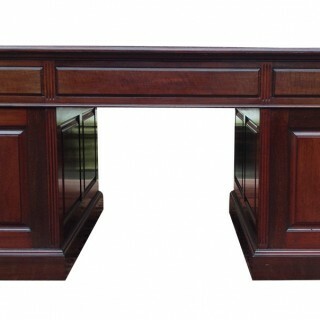 The desk has raised ‘fielded’ panels to all sides and top indicating the quality of workmanship involved. 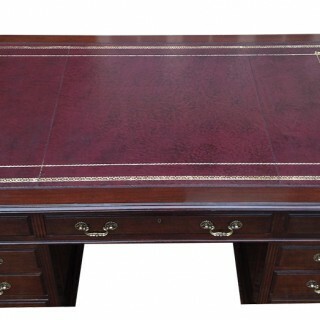 It is a beautifully proportioned desk with a lovely colour. The desk is made in three sectins: top and two pedestals, for ease of transport and instalation. The top is fitted with three drawer with original “Hobbs” locks, moulded edges to the drawer fronts and original cast brass handles. The pedestals have fluted edges and are fitted with three drawers standing on plinth bases with hidden castors. 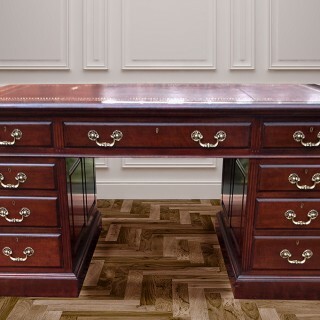 This handsome antique mahogany pedestal desk would look equally good in traditional or contemporary settings. Excellent condition with replacement leather seat cover.